At midday, my husband and I leave our computers and sit down to lunch. Soup, hearty and rich and filling, is a mainstay on our lunchtime table. Either one of us will toss the ingredients into a single pot around noon, and let it simmer until done, when we sit down to eat, supplementing lunch with a big salad, a slice of no-knead sourdough bread, homemade fermented vegetables and chicken liver pate from time to time, too. I save the leftover soup to add to our son’s lunchbox the next day. I warm it on the stove in the morning, pour it in a thermos, and set it in his lunchbox along with a small serving of sauerkraut or sour pickles. From time to time, I make a double batch, pouring the leftover soup into pyrex containers (like these) to freeze for an easy lunch or dinner some time when we’re too busy or tired or overextended to cook. We have our favorite soups, to be sure: Sweet Potato and Poblano Pepper, Lentil Stew with Winter Vegetables, Bacon Leek and Potato. 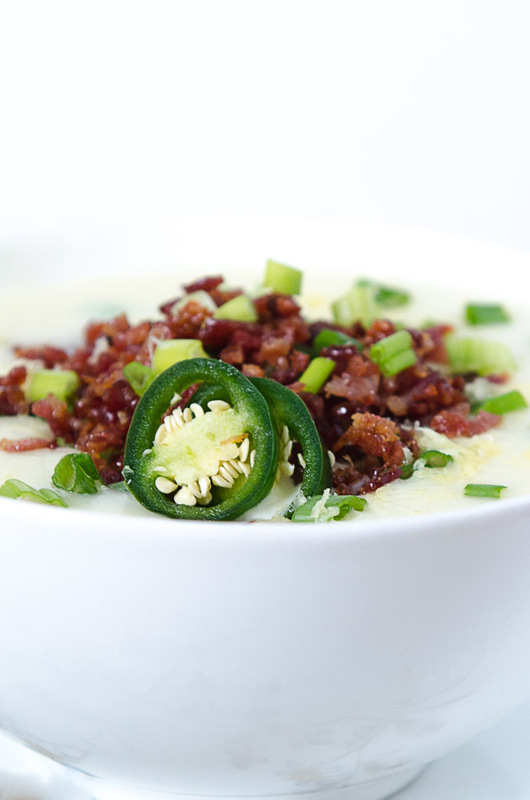 With a glut of potatoes from our CSA to work our way through, we’ve found ourselves leaning upon a new favorite: Loaded Baked Potato Soup topped with sour cream, sharp cheddar cheese, crispy shoulder bacon, green onion and thinly sliced jalapeno pepper. A New Kind of Bacon? As you longtime readers know, bacon is particularly well-loved (over-loved?) in our home. Its salty, smoky crispness goes particularly well with potato. I’ve been working as an advisor to Applegate over the last year, and, recently they released Good Morning Bacon, which is a leaner bacon cut from the shoulder rather than the belly. Its flavor and texture is reads like a cross between bacon and ham. The shoulder is typically an underutilized cut of pork, though it makes a lovely bacon – leaner, which means less fat will render, so the bacon yields more smoky, salty meat which is particularly well-suited to culinary applications that are already rich and don’t want for more richness – like this ultra-creamy, rich potato soup. Dump the potatoes into a heavy stock pot. Cover with broth and bring to a boil over medium-high heat. Simmer, covered, until the potatoes fall apart when pressed with the tines of a fork, about thirty minutes. While the potatoes boil, heat the ghee in a heavy skillet over medium-high heat. When it melts, reduce the heat to medium, and toss the bacon into the pan. Fry it in the hot fat until crispy, about 20 minutes, and then transfer to a plate with a slotted spoon. Turn off the heat to the potatoes. Pour in the heavy cream, salt, pepper and half the grated cheese. Stir 1 to 2 minutes, then puree with an immersion blender until smooth. Ladle into bowls. Top the soup with the remaining cheese, the sour cream, the green onion and the reserved bacon. will be making this for sure. I used to make a potato soup and had forgotten about it. love your book! Getting ur greens at each MEAL rly is easy! Hmmm, will make this sometime soon. We live in the tropics where it is never really soup weather but we looooove all sorts of soups and make them often nonetheless! And another good thing: my little girls (who can be fussy) love soups too. Another great looking one to add to the list! Thank you. Fabulous recipe — can’t wait to try it! That’s great information about bacon. I’ll have to look for Good Morning Bacon. How much water should be left in the potatoe pot after you turn off the heat? Hi! Looks yummy. I have this on the stove right now and I’m curious about the jalapeno. Is it solely a garnish? There’s no directions for its use, unless I’m totally blind right now!! Either way, it’s bubbling on the stove and smells delicious!! Mmm!! I made this last night and it was delicious! The toppings really make it, so make sure you add them (although we didn’t do jalapeño). My 9 year old told me “My taste buds are dancing!” I guess that’s approval! This soup is awesome! I made it the other day, it was fast and easy, and my husband said “Did you use a recipe for this one? Because I want you to recreate it exactly again and again!” Will share this recipe and your site with others. Thank you! This looks awesome! We just had a night of snow flurries in Kansas and I think a good potato soup is on the menu for dinner tonight now! Applegate has had wonderful products, Jenny, but I read online that it was just bought for megabucks by a megacompany in the food industry. Hi Arche, as of this time (and currently) Applegate is still a family-owned business. Looks great. I love potato soup. Will try yours soon. I must admit, when I first read this post, I thought there is no way this potato soup could be made on a “lunch” hour. That, and it couldn’t possibly have much flavor to it. Well, I was wrong on both accounts. I’ve made a lot of potato soup recipes over the years. All time consuming in one fashion or another. 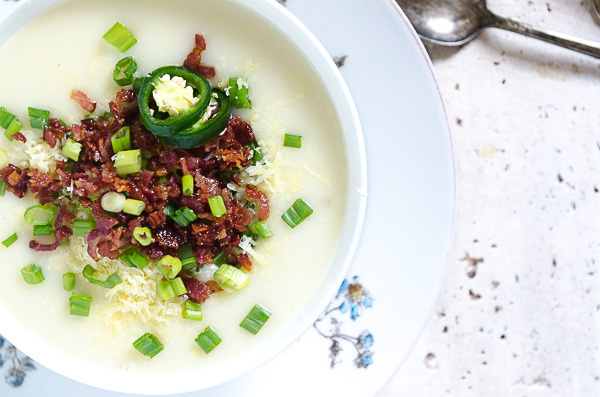 This recipe was the easiest and the best potato soup I have ever made, seriously. I made one substitution, Yukon Gold potatoes for the russet, because it’s what I had. Amazing recipe, on the table in about 40 minutes. Thanks for posting it! I will definitely be making this again. I’ve had it for dinner, breakfast and lunch, haha. Because I do not tolerate large quantities of dairy at one time, I used coconut milk in the place of dairy milk. That was the only substitution I made. My husband, who doesn’t care for coconut milk, had no idea i used coconit milk. He, and our kids, loved the soup. Thanks for a great recipe. Jenni, I’ve used your bacon recipe for years with wonderful soy free organic bellies. How would this work with a shoulder? Your cookbooks are at the center of my kitchen. THANK YOU! Yes, and they continue to operate autonomously and independently.